In the 21st century, the era of mobilization and the internet, we are always in search of new ways to secure our privacy and data. Currently, the most promising method is two or more factor authentication which we call Multi-Factor Authentication. Most ubiquitous examples might be e-mail authentication or payment gateways. 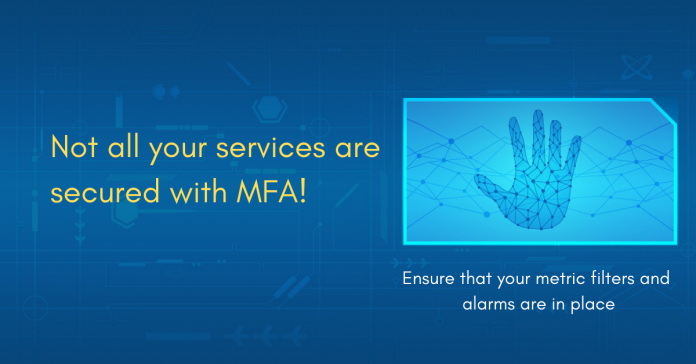 But the past record of MFA is also not exceptional since security breaches happen in the ecosystem of MFA as well. Therefore, you cannot solely rely on this. So, what should you do for these sign-in consoles that are not even secure with MFA in AWS? In the management console of AWS, you can monitor all the API calls and console sign-in by directing CloudTrail logs to CloudWatch Logs in order to establish corresponding metric filter and alarm. An alarm is triggered every time an IAM user calls for an API or sign in into your console. A report by Forrester (Market Research Company) also states that 80% of security breaches involve privileged credentials. Implementing CloudTrail and CloudWatch logs will increase the level of protection and visibility into your AWS account. Since all these records get stored into your S3 bucket, you can check your every record and logs anytime. Why do you need the help of Centilyitcs? Centilytics ensures that a trail in CloudTrail should be created and metric filter alarm has been configured in CloudWatch. We provide you with all the important information regarding your trails and logs in a tabular form for a better understanding. Centilytics monitors all of your settings in real-time and reminds you of the criticality of paying attention if something is not working. This helps ensure that your data remains safe. Ok: The CloudTrail has CloudWatch log groups configured with metric filter, alarm, SNS topic with at least one subscriber.